Lifestream Barley Grass is a 100% pure, New Zealand grown certified organic wholesome green food made from the powdered leaves of young Barley Grass plants (Hordeum vulgare). It contains naturally occurring phytonutrients, chlorophyll and folic acid in a perfect `nature-made` blend. Lifestream young barley plants are harvested at peak potency and `flash air dried` in minutes to ensure the nutrients are not damaged or compromised. This is shown by the rich Chlorophyll content, which is a good indicator for correct growing practice, high quality plants and gentle processing. Lifestream also mill their plants to an ultra fine particle size to ensure easy mixing and absorption. 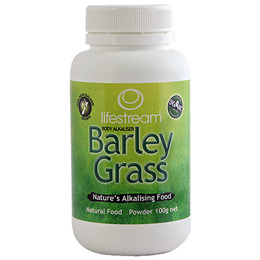 Lifestream Barley Grass contains only the barley grass plant. No GMO`s are used in the production or processing of this product. Lifestream Barley Grass is free of pesticides, chemicals, preservatives, additives and fillers. Premium Certified Organic Barley Grass Powder - 100% Pure. Adults: take 1 rounded teaspoon daily with food. Children aged 5 - 15 years: generous half of a teaspoon daily with food. Add to fruit juice or stir Barley Grass powder into food after cooking. To make a fruit smoothie, add to a blender 3 cups of tropical fruit juice, 3 teaspoons of LifeStream Barley Grass powder and 1 banana and blend until smooth (makes 3 servings). Below are reviews of Lifestream Barley Grass Powder - Organic - 100g by bodykind customers. If you have tried this product we'd love to hear what you think so please leave a review. Tried other products but this one is the cleanest and most natural I have found. Great job. 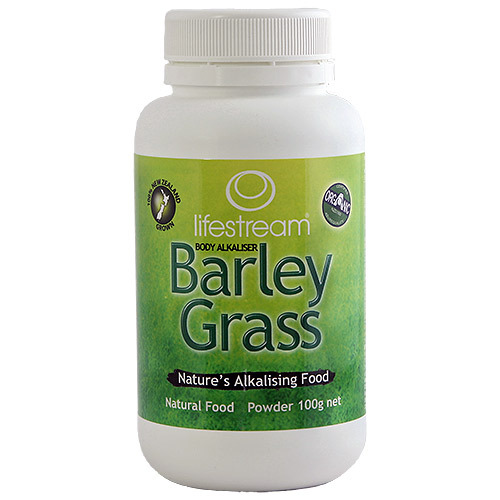 Question about Lifestream Barley Grass Powder - Organic - 250g What type of person would benefit from barley grass? Question about Lifestream Barley Grass Powder - Organic - 250g How should I take this? Question about Lifestream Barley Grass Powder - Organic - 100g What type of person would benefit from barley grass? Question about Lifestream Barley Grass Powder - Organic - 100g How should I take this? Lifestream Barley Grass is a 100% pure, New Zealand grown certified organic wholesome green food made from the powdered leaves of young Barley Grass plants.